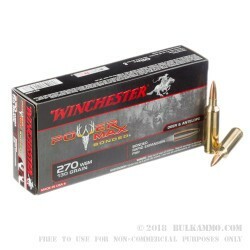 With the massive expansion and long-range accuracy that it provides, This 270 Win Short Mag cartridge from Winchester’s Power Max Bonded line of ammunition is designed specifically for hunting whitetail deer. 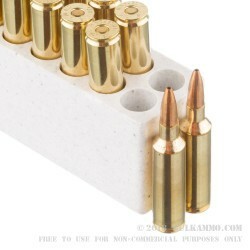 Its 130 grain protected hollow point projectile is notched to promote rapid expansion for quick knock-down. 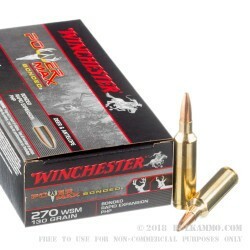 Winchester’s proprietary Bonded Core technology sees to it that this bullet’s core and jacket remain virtually inseparable after impact -- its lead core is thoroughly bonded to its contoured jacket, promoting optimal weight retention and penetration. Along with its muzzle velocity of 3,275 fps, this is a cartridge that’s certain to deliver the next time deer season rolls around. 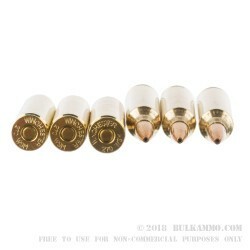 This cartridge’s non-corrosive Boxer primer and factory fresh brass casing make this round perfect for handloading. That means that even with 20 of them to work with, you’ll have the multiple deer seasons ahead of you covered. You can always count on Winchester.